Welcome to The Napton Kitchen…a home from home, eat in or takeaway, you can enjoy fresh in store baked croissants or a cooked breakfast, fresh filled rolls, homemade soup or a local produce ploughman’s for lunch or why not round the day off with tea and a homemade cake in the afternoon. The Napton Kitchen serves homemade fresh food all trading hours, hot food ordering is available 7am~3.30pm Mon – Fri, 8am~3.30pm Sat, 8am~11.30am Sun, 8am~1.30pm Bank Hols. Hot and cold drinks and homemade cakes and pastries are served all opening hours. 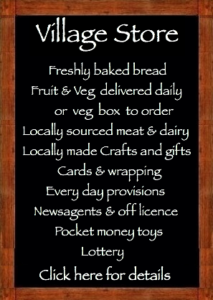 We are a friendly, family run kitchen in a village store, so we will always have something on offer if you can’t find it on our menu, if it’s avaiable in the shop we can make it in the kitchen. Allergens catered for too. The coffee is from a barista machine, the teas are by Twining’s and if you fancy something chilled we have fresh milk milkshakes plus many other soft drinks. We have indoor seating for 13 and outside for 18, come and be part of our hub of the village, its a meeting place for the community as well as a well earned respite for walkers or cyclists – everyone is welcome! We offer a bespoke outside catering service, tailored to your taste and budget. 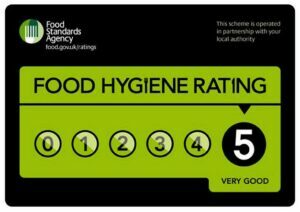 Whether you are a local business and need lunch, are having a BBQ or house party and just need some homemade hot or cold buffet food delivering – or a family occasion at a self catering venue and you would like honest home cooked food served, then come and talk to us, it’s what we do best. For more information on our outside catering just click here! Having friends round or need a cake for the office? Why not order a whole homemade cake from us, made with local free range eggs. 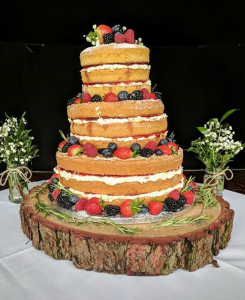 Many of our fabulous sponges can be made into ‘naked’ wedding cakes. Handmade to your specification. Priced Individually.